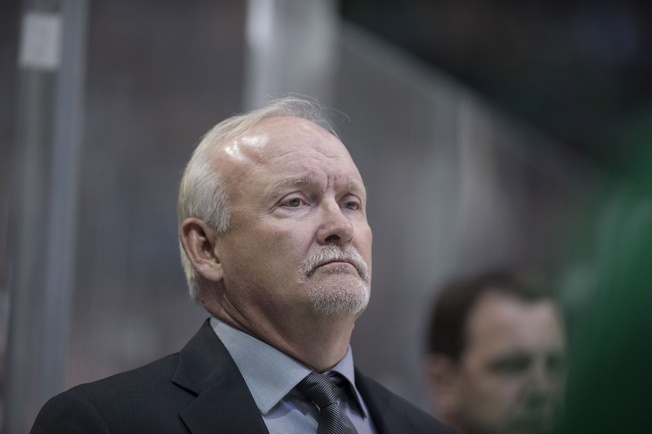 Lindy Ruff won’t be back behind the bench of the Dallas Stars. General manager Jim Nill confirmed the news on Sunday, with Ruff’s current four-year contract set to expire after this season. It was not renewed. The Stars finished their regular season with a record of 34-37-11, good for 79 points. That’s the second lowest point total for the franchise since they relocated from Minnesota to Dallas, which is a tough pill to swallow. The club had the best record in the Western Conference in 2015-2016. The Stars have reached the playoffs for two out of four seasons under Ruff, but expectations were high this season and it just didn’t pan out. Injuries were part of the problem, with Patrick Sharp, Jamie Benn and Jason Spezza all missing considerable time. Mattias Janmark was out all season with a genetic knee disorder, while Ales Hemsy, Antoine Roussel and Cody Easkin also sat out with injuries. Ruff leaves the Stars with a 165-122-41 record over four seasons. He spent 15 seasons as the coach of the Buffalo Sabres prior to his Texas tenure. There are a lot of ways to break down what went wrong in Dallas this season, but coaching will always be a factor in the final analysis. Still, Ruff had less to work with in 2016-2017 and that made a big difference. The Stars put together a less-than-stellar blueline and had the worst goaltending in the league, plus their penalty kill was dismal and they went through a drop in scoring that weighed on their younger defensive core. There is speculation about who’ll draw the next assignment in Dallas, with names like Gerard Gallant and even Ken Hitchcock among them. Time will tell, but Nill sure has his work cut out for him.